Shen was born in China, but raised in Hawaii. Due to his father's job, he spent every summer vacation growing up in Japan. When he was 21, he decided to move there. Micro is a Japanese native. The group itself was named by Rize vocalist Jessee (a friend of the group). 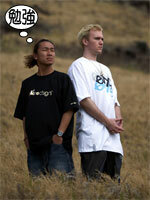 Def Tech refers to their style as "Jawaiian reggae" (Japanese, Hawaiian, and Reggae). This group is very self contained: They write lyrics and music, arrangement, and do production all themselves. In 2007, Def Tech broke up due to musical differences. Micro began a solo career shortly before the group's breakup was announced, and Shen seems to have some sort of involvement with a clothing company called Solario.